To make Oyster Catchup - Take a Hundr'd large oysters with all their liquor a pound of anchovies, three pints of white Wine, half the peel of the a Lemon, and lemon sliced; boil these gently half an hour, and strain them through a hair seive; add a quarter of an ounce of cloves, the same of mace and nutmegs, boil all a quarter of an hour; put in two ounces of shalots, and when cold bottle it with the spices, and shalots in. 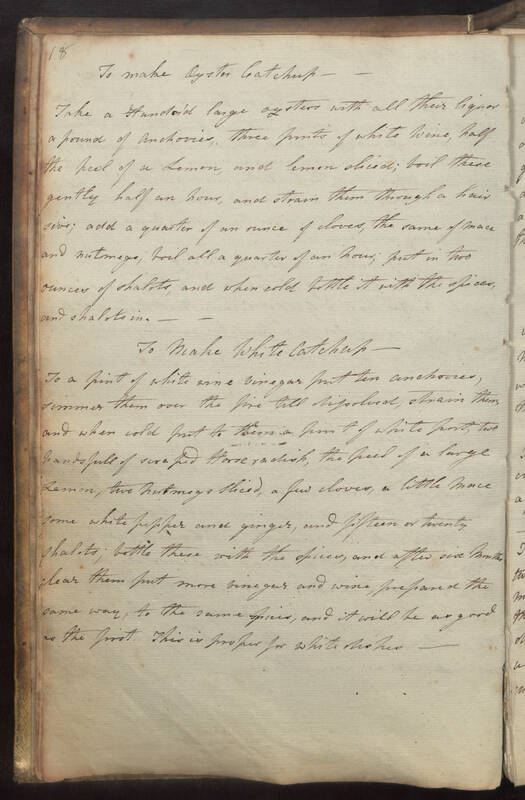 To Make White Catchup - To a pint of white wine vinegar put ten anchovies, simmer them over the fire till dissolved, strain them, and when cold put to them a pint of white port, two handsfull of scraped Horseradish, the peel of a large Lemon, two nutmegs sliced, a few cloves, a little mace some white pepper and ginger, and fifteen or twenty shalots, bottle these with the spices, and after six months clear them put more vinegar and wine, prepared the same way, to the same spices, and it will be as good as the first. This is proper for white dishes.